Derived from the sword used by Celtic tribes of ancient Iberia (Spain) and adopted by the Roman Legions, the gladius was the scourge of the battlefield and often the last thing seen or felt by Rome's enemies. 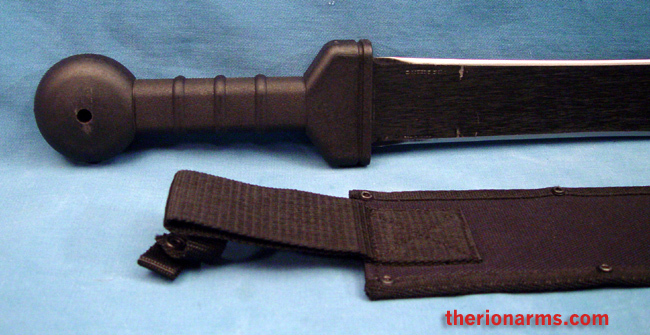 This modeernized gladius/machete features a 1055 carbon steel blade hand sharpened to a murderous point and wicked edge. The wasp-waisted blade is in the early Republic 'Mainz' style, and has a black baked-on anti-rust matte finish. grip and pommel: 7 7/8"